A strong network is like money in the bank. Your network can help you build visibility, connect you with influencers, and open up doors for new opportunities. Building and nurturing a network is one of the most powerful things you can do to support your career advancement. Yet often, our networking efforts are just social, haphazard, and as a result, ineffective. You make friends and connections, however, these people are not always in a position to help you further your career or most importantly, they may not be willing to speak for you. Networking proactively is important. What happens if you don’t have a strong network, and suddenly you lose your job? If you don’t have a network to tap into, you’re out of luck. It will most likely take you much longer to find a new position. And how can you get information about a hiring manager or new boss if you don’t have a network of people to provide that information? 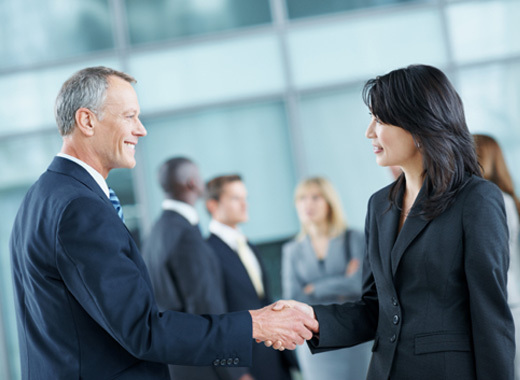 Networking proactively provides an advantage by supporting you with a powerful collection of people who are willing and able to speak for you on an ongoing basis. The network is there for you when you need it because you’ve built the social capital. Strategic networking is more than socializing and swapping business cards, it’s creating solid relationships to support your career aspirations. It takes focus and intention to build such a network, but it’s invaluable for your professional development. Women’s failure to network strategically is one of the career pitfalls cited by Barbara Annis and Associates in their White Paper, Solutions to Women’s Advancement. Identify who you know and who you need to know to help you reach your career goal and build a power network to support your advancement. 3. Create a diverse network. In order to network effectively, you need to move out of your comfort zone and identify people who can help your career, not just those people you like. Highly open networks, a diverse set of individuals who don’t know one another, is often associated with faster promotions, higher bonuses, and strong performance reviews. Men are more likely to have these open, efficient networks and at least twice as likely as women to say that they look for relationships at work that can help them get on the right assignments and get ahead.